Dan Barber in the kitchen and Steph and I have a seat at the bar for a three course meal. Life is very, very good. Full story and photos to come! Rachel Ray for a Day--Syracuse on $40! When people think of the cities of New York--the big one, New York City comes to mind. But in the heart of New York State lies a city on the lake that offers great art, a world-class university, outdoor activities such as mountain biking, trails, skiing and water sports just minutes from downtown--and FABULOUS food. Today we're going to the Salt City--Syracuse, New York. Syracuse gets its name from a town in Sicily, Italy but its nickname comes from all the salt it produced in 19th century. Street names like Salina are reminders of a formerly vibrant industry. The salt may be gone but there is plenty of spice in this city. I've got $40.00 in my pocket--will that be enough for me to get a taste of Central New York? We'll see. Sitting on Onondaga Lake, just 90 minutes south of Lake Ontario, 3 1/2 hours from Manhattan and Toronto, and a stone's throw away from the Finger Lakes, Syracuse is a city of just 230,000 but has the art, culture, and culinary scene of a much larger place. This is the place that invented both the ferris wheel and the 24 second shot clock. This is one of the historic homes of the 20th century Arts and Crafts movement--world famous Stickley furniture is made in the area to this day. The Syracuse area is also known for its farms--dairy, produce, and livestock--which dot the picturesque landscape surrounding the city. Sure you'll find a good share of Irish pubs, diners, and Italian restaurants but you can also get great Thai, Vietnamese, Mexican, and new American cuisine that sources fresh, local, and organic ingredients. My day started off on the right foot with breakfast at the Lucky Moon Cafe in the burgeoning arts district that includes the Syracuse Stage theatre. Lucky Moon has been open just a year and has quickly become the place for delicious omlettes, sandwiches, and soups as well as poetry slams and music in the evenings. Located in the building that houses the Onondaga School of Massage and the luxurious Spa Zend day spa, Lucky Moon has quickly become a part of the happening Syracuse scene. I knew I had a big day ahead so I sought the soothing vibe of a Lucky Moon breakfast to get me started. I was the lucky one today to have co-owner Roxanne herself prepare my omlette. 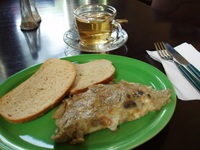 Two eggs, mushrooms, bacon and cheddar cheese with a side of tuscan toast and a cup of white jasmine tea. I pulled up a seat, grabbed a copy of the latest Syracuse New Times while Roxanne got busy behind the counter. A few minutes later I was in heaven--the omlette was perfectly prepared with bits of white cheddar oozing out of the sides and crispy bits of bacon studded throughout. Well fed and with a pla n for the day I headed out to explore the area. But my tab wasn't going to slow me down. That omlette with toast and tea only came to about $7.00 leaving my pockets as full as my tummy. With all of its urban charms, Syracuse is also considered the eastern anchor of the Finger Lakes Wine country. The Finger Lakes are made up of 11 lakes that stretch vertically down the center of New York State like long fingers. Renown for their beauty this region is also home to the oldest wineries in New York. Dr. Konstantin Frank and Bully Hill are the grandfathers of the wine revolution in New York but in recent years vineyards such as Silver Thread, Red Newt, Glenora, Bloomer Creek, Sheldrake Pointe, and Lamoreaux Landing to name a few are creating a wine and food scene that is drawing folks from all over. One of the newest restaurants on the scene is at Elderberry Pond Farm--an organic farm that has been in operation for over twenty years. 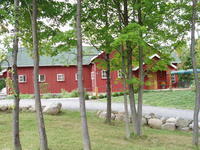 Located in Auburn--near Skanealeles Lake,it provided a great trip to the country but was only thirty minutes away from downtown Syracuse. The restaurant had is first summer season this year and the food has proven to be worthy of the hype. The visit to Elderberry Pond Farm today fit in perfectly with my desire to eat locally--especially this month for the Eat Local Challenge. And at Elderberry Pond you can practically walk to your food source. 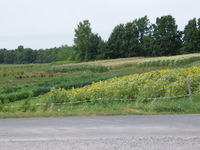 Many of the vegetable fields and orchards are just across the road from the restaurant and the meat is organically raised just a few miles away in the adjacent town of Weedsport. 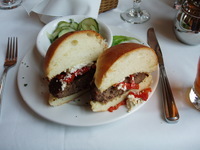 I'm not usually a big burger person these days but I couldn't resist the Angus burger with feta and roasted peppers that topped the Elderberry Pond seasonal menu. This has to be the thickest and juciest burger I've ever had. A cool cucumber salad was served on the side--just as fresh and flavorful as if it had been picked that day--because it probably had. The restaurant also features an excellent wine list made up of wines from New York State, California, and Europe that reflects the owners expertise in pairing up food wines that delicious and often organic. Plus, almost all of the wines they offer are sold by the glass--an excellent way to try something new without a huge investment. How big is this burger? Hmm! So. Good. Pamalee Reeve, the pastry chef at Elderberry Pond Farm is quickly making a name for herself. After I made her Raspberry Almond Tart from the Gourmet magazine article I knew I couldn't miss dessert. 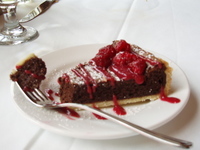 I was rewarded with a luscious chocolate tart topped with freshly picked raspberries and drizzled with a raspberry puree--incredible. I would come back here just for the dessert. In additon to the restaurant, Elderberry Pond operates a small store where you can pick up their homemade jams, organic chickens, beet greens, and other fresh produce. 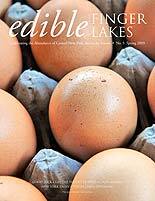 New York State cheeses and dairy products are also sold. So how much did this trip to the country set me back--just over $17.00. With tax and tip my grand total was $20.00. That brought me to a total of $27.00 leaving me $13.00 for the rest of the day. One of the major centers of creativity, intellectual exploration and technological and environmental innovation has been Syracuse University and the State University of New York's School of Envrironmental Science and Forestry (SUNY-ESF). A day in Syracuse wouldn't be complete without a visit to University Hill. The SU campus is a great place to hang out whether or not you are a student. The campus plays host to everyone from Gary Trudeau to Michael Moore to Soledad O'Brien to Snoop Doggy Dog. There is always something going on. This is also the place to come for one of the best views of the city--watching the sun set over downtown and Onondaga Lake is a breathtaking experience. 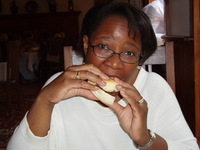 But all that walking has made me hungry--time to think about dinner. With thirteen dollars in my pocket I wanted a good meal that wasn't going to do a number on my budget. A few students who were back early for Orientation week led me in the right direction. Alto Cinco was the call. Alto Cinco is located about 15 minutes walk from the SU campus in what is affectionately called the Westcott Nation--the "Berkeley, CA of Syracuse". So not only was I going to get great Mexican food--it was going to be healthy (even vegan if I wanted!) and affordable. I walked into Alto Cinco and they were packed--as they are every night they're open. Monday nights usually feature wine flights and on nice summer nights like tonight, tables and people spill out onto funky Westcott Street. I found a spot in the restaurant and tried to settle on what to eat. My problem was--everything looked good on the menu. But there it was: a catfish burrito with chiplote mayo, rice, and cheese. Hmmm mmm. And for just two dollars more I get a piece of the scrumptious jalepeno cornbread (I can never say no to cornbread) and a side salad. But the joint was packed so I took my order to go. At Alto Cinco the small touches mean alot. 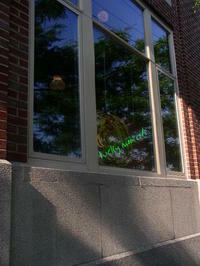 All their cooking relies on great, fresh ingredients. So I shouldn't have been surprised to find my little side salad filled with tasty things sliced radishes, cucumbers, scallions, and a variety of lettuces. 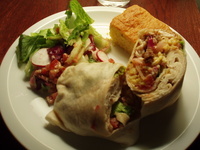 The burrito, large enough to feed a small family, was a revelation. Each bite yielded tastes of lightly fried catfish, spicy mayo, rice and a warmed flour tortilla. I could only finish half of it--bonus, lunch for tomorrow! But the cornbread, if you could find a crumb of this wonderfully moist and spicy slice you'd be lucky. Did this feast cost me mucho dinero? Not a chance. With tax and tip I was only out $12.00. Leaving me with a grand total of $39.00 for the day and one dollar in my pocket. There's a great tip: when you're visiting a college town, ask the students. They'll always have the scoop on good food, cheap. Not content to leave without something sweet to remember my visit, I spied some amazing looking chocolate chip cookies by the register. So I grabbed a cookie and took a walk down the tree-lined streets of this urban neighborhood as the sun set on a fabulous day in Salt City--Syracuse, New York. Thanks, Sam, for hosting this Dine and Dish #4 and giving me the chance to show off my new home town. But Rachel Ray can have her job back, I'm all "perky-ed" out.